Disclosure: A product was received to help facilitate the review. All opinions stated are genuine and my own. I drink coffee year-round, but I especially love a good cup when it's cold outside. I know many of you can absolutely relate. The Rogers Family Company knows good coffee!! Take a look at the history behind their special holiday blend and you will be amazed! I was amazed. Our 2013 Organic Holiday Blend is complex yet balanced with good acidity and notes of spices and chocolate, resulting in a creamy body and a bright bold finish. I took his picture right when we opened the pkg. He's laughing because it's so big! If you like to grind your own beans to ensure the freshest cup of coffee, these beans are such a welcome addition to the kitchen! The 3 lb. bag is NOT small either. You can see from the picture above that a 3lb. 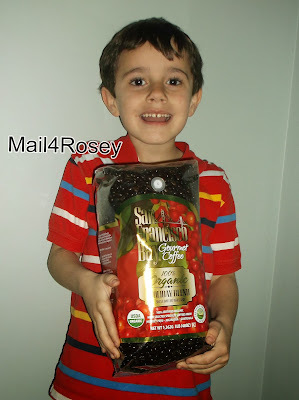 bag of beans is half as big as my 6-yr. old. :) Certainly it is enough to get you through the holidays and provide a lot of happy, hearty enjoyment in the form of good coffee, for you, your family, and many, many guests. Take a look at the Rogers Family Company Coffee & Tea online market. They've got beans, ground coffee, single cups, tea, gifts, specials and more! Everything is delightfully packaged, delicious, and very affordable. The big bag of coffee pictured above is on sale right now for $20.99. One winner is going to get a 3 lb. 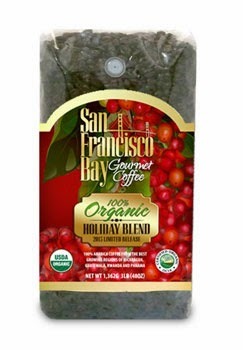 Holiday Blend (unground beans) of their own (just like the one reviewed). This would make a great gift, and/or it would be great to keep for yourself! You can learn more about Rogers Family Co. and their products by visiting their website. There is free shipping on a two pound bag. Entered giveaway as Katherine. "Once we get the beans, we roast our coffee slowly and carefully using our exclusive varying temperature/airflow process - a mix of artisan roasting and scientific excellence. Finally, we lock the coffees' freshness right away as we seal the roasted coffee away from the harmful effects of the air within minutes of roasting." I like the variety they offer. That is a huge bag! They have some great sounding flavors. that bag is almost the same size as him!!!! I would like to try their Caramel Creme Coffee. My Hubs drinks enough coffee for both of us and I love the free shipping on 2 pounds of coffee. I would really like to try the Coconut Cream Coffee. Thank you for the super giveaway opportunity. Keep up the terrific blogging. That would be my hubs. He is the coffee addict. I don't seem to have much desire for it. I'll drink it if I make my own. I like it a certain way. I learned that on Friday after Thanksgiving they have a 30% off site wide + free shipping. I learned they offer gift baskets. I would like to try your Pumpkin Spice and Swiss Chocolate Almond flavored coffees. I think it's really cool that the company is actually operated by the Rogers family -- especially since it's one of the nation's few remaining family owned, gourmet coffee roasters. I would really like to try their cinnamon orange loose leaf tea. I like the Flavored Convenience Packs - thank you. I wish I could try the Hawaiian Blend Coffee. It seems like I've heard...Hawaii has really good coffee. I would love to try the chocolate raspberry coffee. I learned that Rogers Family roast their coffee slowly and carefully using their exclusive varying temperature/airflow process – a mix of artisan roasting and scientific excellence. I learned how varied there selections are! SO MANY CHOICES! If one wants to try out the sample sized coffees, one may receive free shipping. They are 100% family owned and operated. I'd love to try the caramel blend coffee. :) I, too, love that they're family owned & operated. Coffee isn't the only thing they offer. They offer gourmet teas too. YUM! I like the Fog Chaser Coffee. to try their Caramel Creme Coffee. I learned that they were established in 1979. I learned that they have an overwhelming coffee selection. The Rogers Family Company has been in business since 1979 and is one of the nation's few remaining family owned, gourmet coffee roasters. I learned that every year, their coffee buyer, Pete Rogers travels the globe to find the very finest coffees available. Right now Roger's has 20% of Gold's coffee!! coconut cream coffee looks yummy! I love that they are family owned and operated. Thanks for hosting! I think that I would like the San Francisco Bay OneCup Fog Chaser Coffee. I learned that they have a community aid program that is helping to break the cycle of poverty in the communities that grow their coffee. I learned that the also carry organic coffee and I would love to try their Organic OneCup Single Serve! I'd love to try the Amaretto Milano Coffee. I would love the Southern Pecan Coffee. It sounds so good! I like the massive variety of organic coffees they have. I like the Chocolate Coffee Lover's Basket. They have a nice selection of coffees. I would like to try the Cinnamon Orange TN Spice Loose Leaf Tea. I learned they have Gift Baskets! I would give the Black Mountain Gold a try. I learned that it's 100% organic which is great!! Coffee is reported to have been brought over to the Americas by Captain john Smith when he founded the colony of Jamestown, Virginia. As in other areas coffee became popular and was soon found in most colonies and cities of the day. Over time, many business deals were negotiated over cups of coffee in coffeehouses all across major American cities such as New York City, San Francisco, and Boston. I would love to try their pumpkin spice flavor. I learned that they have free shipping on orders of $50 or more. I learned: "We are a privately held, 100% family--owned and operated company, and our reputation reflects on us as a family"
I learned that they offer a lot more choices than I could ever need. How cool? Thanks so much for the chances to win this. I like that they use Arabica beans instead of Robusta! Much easier on my stomach! I love that this is a family owned company. I learned that there is free shipping on orders over $50. I learned you can get free shipping on orders $50+. I like that they offer flavored coffees including Fairwinds Chocolate Raspberry Coffee.